John D Smith is the Florida-based inventor of Storm Stoppers® hurricane window protection panels. The product has been sold to over 8000 homeowners in the USA and the Caribbean, with total revenue exceeding US$10 million since 2004. Yet Storm Stoppers® is not protected by a patent, and the first part of Don’t File A Patent tells why. Smith’s experiences in trying to get his patent application through the US Patent and Trademark Office (USPTO) are the basis for his ten reasons not to file a patent application. Certainly, Smith has a grim tale to tell about his encounters with the USPTO, and in particular with the Examiner he calls ‘Ms E P’, and who receives an acknowledgement because ‘without her three absurd Office Action rejections, this book would not have been possible.’ While Smith includes a copy of the third Office Action, and his patent attorney’s letter reporting it to him, one frustrating aspect of the book for a patent attorney reader is the absence of any listing of the claims that were rejected. However, it is apparent from the terms of the rejection that the claims were, by this point, lengthy and specific, and possibly so narrow in scope as to be of minimal commercial value had they been granted. A ten-page rejection of a single claim may indeed be absurd, but it may be no more absurd than a claim that contains so many limitations that it requires a ten-page rejection! The ‘problem’ with Smith’s invention from the outset, from a patentability perspective, is that it consists of a combination of a few components – corrugated plastic sheeting, handles and ‘mushroom head’ fasteners – which are widely available in ordinary hardware stores. This is a great strength of the product from the point of view of Smith’s desire to manufacture and sell it himself. However, the simplicity of the invention, and the fact that it is made of a small number commercially available parts that have been selected for the very properties for which they were designed and made, meant that it should have come as no great surprise when the patent claims were rejected on grounds of obviousness. This does not appear to have been advice that Smith was given at any stage. Furthermore, the course of action proposed in the attorney’s letter reporting the third Office Action, to amend again and then consider an appeal, suggests that he is focussed on trying to secure a patent at any cost, and regardless of the ultimate scope of protection provided. The second – and, in fact, lengthier – part of Don’t File A Patent adopts a more positive note, providing a number of tips and strategies to help other inventors succeed with manufacturing, marketing and selling their own inventions. Much of this is sound advice, and Smith even goes so far as to give away a few original and clever promotional ideas. By his own assessment, Smith’s target audience is not the big companies with the financial resources to build and defend patent portfolios. Nor is it the individual inventors and small start-up companies whose inventions require substantial capital and other resources to bring to market, and therefore may require outside investment, or partnering with other companies, e.g. through licensing arrangements. The primary target audience for Don’t File A Patent is people just like John Smith – individual inventors who want to roll up their sleeves, get their hands dirty, and take on all the risks and rewards of entrepreneurship for themselves. Not everything that Smith writes in his book is accurate. Some of his assertions are completely wrong and misleading. Others – particularly those questioning the propriety and motives of the USPTO and its staff, as well as patent attorneys and lawyers – are borderline libellous, and reflect the uglier face of Smith’s reaction to his experiences. While it is not the purpose of this review to correct Smith’s misconceptions, it is worth noting a few of the book’s more obvious missteps, in the interests of balance. Contrary to Smith’s conspiracy theories, the USPTO is not more interested in taking applicants’ money than in granting patents. Under current funding arrangements, the PTO does not get to keep all of the fees that it collects, but instead has a capped budget. As a result, it is insufficiently funded to deal adequately with the number of applications it receives. Logically, therefore, the Office would benefit if the number of applications filed actually fell to a level at which the fees collected were exactly equal to the appropriation it receives from Congress. The PTO does not reject 70% of patent applications, as Smith suggests on page 23 of his book. The ratio of patents ultimately granted is much higher than this. It is true that the study cited by Smith found that 70% of Office Actions reject one or more claims. However, this says nothing about the reasons for those rejections, or how many applications subsequently go on to become granted patents after further prosecution. Contrary to Smith’s reason no. 9 not to file a patent application, patent maintenance fees do not pay for the PTO to ‘maintain’ a patent (to ‘oil the gears’, as Smith puts it). They do help pay for the operations of the PTO, which therefore keeps other fees lower. However, their primary purpose is to ensure periodically that only those patents which the patentee has a sufficiently strong desire to maintain are kept in-force. It must be remembered that a patent represents a monopoly, i.e. a restraint on free competition. If a patent is not worth enough to its owner to justify the payment of a few thousand dollars over its lifetime, then it is better that it expire so that others are free to make use of the patented technology. The level of the fees is set to strike a balance between affordability, and providing a disincentive for a patentee to maintain a patent that is not being used for commercial benefit. There is no evidence to support Smith’s conjecture, in his tenth reason not to file a patent application, that the USPTO shows favouritism to large companies, such as IBM. The reason that IBM has been the top recipient of US patents for the past 18 years is simply because it has filed more patent applications than any other company. Yet, despite these flaws, everything written in Don’t File A Patent is true, in the sense that really matters. The events that Smith describes actually happened to him, and his emotional and intellectual responses to those events – however much they may derive from his initial naïveté – are genuine. Other inventors, patent attorneys, and administrators in the USPTO will ignore what Smith has to say at their peril, because for every one person who writes a book there must be hundreds, or perhaps thousands, of others who have the same experiences yet remain silent. You have to admire Smith’s determination, energy and work ethic. Despite being knocked around financially and emotionally by the Examiner’s repeated rejections of his patent application, he has picked himself up, dusted himself off, and not only made a successful business of his Storm Stoppers® hurricane window protection panels, but he has also written a book that deserves to be successful in its own right. He accurately describes himself as ‘a persistent SOB who never gave up’. If Smith were a lawyer, his book would need a disclaimer. All information in his book is provided to the public as a source of general information based on his own personal experience. In legal matters, no publication can take the place of professional advice given with full knowledge of the specific circumstances of each case, and proficiency in the laws of the relevant country. Don’t not file a patent application just because Smith says so, but if your circumstances are at all similar to his, then you could do a lot worse than read Don’t File A Patent before seeking professional advice specific to your case. 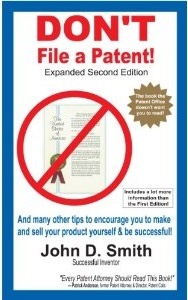 Don’t File a Patent (expanded 2nd edition) is available for US$24.95, as a paper book or an e-book (PDF) directly from John D Smith at www.dontfileapatent.com, or through Amazon.com. A review copy of the e-book was provided to Patentology by the author.